We at the PPCC are probably the last people who should be reviewing the recently-remastered Telugu classic, Maya Bazaar, as we don't know Telugu, are fuzzy on Mahabharata family trees, and we tend to fade out a little during our friends' stories of N.T. Rama Rao, legendary actor-turned-politician. But if our blog usually attempts to be well-versed in movies, let it also be a record of our ignorance. Maybe there'll be a day in the future when we'll be savvy connoiseurs of Telugu and Telugu movies, and we'll be able to laugh softly at our total and complete not-knowingness here. Right? RIGHT? Well, maybe. A blog can dream. So, as you can tell, Maya Bazaar is a Telugu classic centered on a subplot of the Mahabharat and starring the legendary N.T. Rama Rao (who later created the popular Telugu Desam Party in Andhra Pradesh - interesting factoid!) as Lord Krishna. Thankfully, there is a Wikipedia entry for this film, so we can at least confirm some of the plot. But what we basically understood was this: there is the usual Mahabharat divide between the Kaurava and Pandava families, who are cousins. See the Mahabharat for more details. (Or, if you are a fan of Shashi Kapoor, see the excellent Kalyug.) Incidentally we have just recently learned about how, if you worship Vishnu, you have three white vertical marks on your forehead, and, if you worship Shiva, you have three horizontal marks. So each family has either the marks of Vishnu or of Shiva; interesting! N.T. 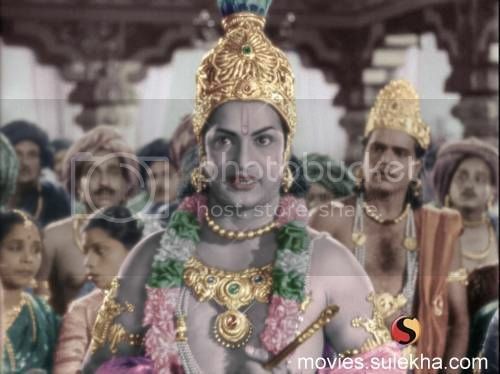 Rama Rao as Lord Krishna. He was really, really charismatic. Anyway, there are two young people - a zesty girl who's name we didn't catch but who lives in the house with Lord Krishna and his brother, so she must be related (? ), and a comically macho young man, Abhimanyu (Akkineni Nageshwara Rao) - who are in love, and have been since childhood. The older generation seem happy to arrange the match. Then one of the ladies in the older generation with the arched eyebrows says something in an arch way, and suddenly the lovers are crying and everyone is upset. Abhimanyu yells angrily (threatening something? promising something? who knows!). Then there is a fantastic bit where Abhimanyu and his mom are travelling through the forest with their driver, and a comical gang of rakshasas (?) - well, people with superpowers - try to stop them. Abhimanyu is an ace archer though, so he manages to defeat all these supernatural attacks with the cunning use of various custom-made arrows. Eventually, the leader of the rakshasa gang shows up as a very very large man with a mallet of some sort, and he and Abhimanyu engage in a most entertaining show-down. Abhimanyu loses, but leaves with only a bruised forehead and new friends among the rakshasas, who admire him for his courage. And help on help! Should we read Devdutt Pattanaik, whose Maharabharat-suplot novel, The Pregnant King, was (if you'll pardon the pun) divine, and who has written extensively on Hinduism in general? Or should we read Roberto Calasso's Ka, that is in every bookstore of the city and is recommended by the expats? Or both? 1. N.T. Rama Rao is cool. First of all, we were the only people in the theatre that didn't fall into spasms of pure joy when N.T. Rama Rao appeared. The crowd went wild! At first, we were like, "Which guy? Which guy? That guy?!" But then, during the film, and especially afterwards, whenever we saw N.T. Rama Rao-as-Krishna's face looming over us in the enormous overpass advertisements, we felt a warm glow of affection. Yes - the charisma has worked on us. Suddenly, the story of his dramatic entrance into the Hotel Viceroy of Hyderabad, when he called out for his "brothers" to join him (in the Telegu Desam Party? who has details on this? we're too embarrassed to ask our friends to repeat it), becomes a lot more exciting - now that we can put a face to the name! 2. The tone of the movie. We had a vague sense of Hindi mythological films as being over-the-top spectacles full of larger-than-life show-downs, booming monologues and flying chariots. Again, our only real exposure was Jai Bajrangbali. This is our second Hindu mythology film, and it confirmed our expectations of large-scale fantasy adventure (forests catching on fire! people disappearing!). The audience we watched it with was also very involved - cheering and laughing. What we didn't expect was the tone of the movie. First of all, our understanding of the Mahabharat - and especially the Kalyug ("Age of Vice") that follows - was that it's a somber affair. We expected a downer, with serious people being angry a lot and various smitings. Also, our cultural upbringing - where Jesus reportedly never cracked a joke, and Zeus or God threw thunderbolts at the cheeky - meant that we were completely baffled when... Krishna made jokes! Lots of them! And everyone laughed! He made snarky asides, he delivered punchlines! It was never irreverent, to be sure. It was like Abraham Lincoln's legendary wit - i.e. funny, from someone you respect. But it was so different to how we were raised - where religious figures are uniformly pretty dour - that it was so interesting! It was very cute, and one of the few visual gags thrown in there for the non-Telugu speakers. ...where some very important king guy walks in, with much pageantry and ado. And they show him variously glowing at the reception, and then looking almost a bit shy or weary of it. We found it so unexpected and humanizing, and we had NO IDEA what was going on, and now we're curious. Help! Gasp! You are correct. Remedied. Well, Abhimanyu is the son of Arjuna. The leader of the rakshasas is Gadothgaja, son of Bheema. Please read Rajaji's Mahabharatha. It is THE Mahabharatha. Now i want to watch this- such fabulous bluesness and accessories! Omigod, I love Maya Bazar. I've seen it about 10 times and still laugh out aloud at all the gags (it's one of the funniest movies ever made). Almost everyone in the movie has way too much attitude. 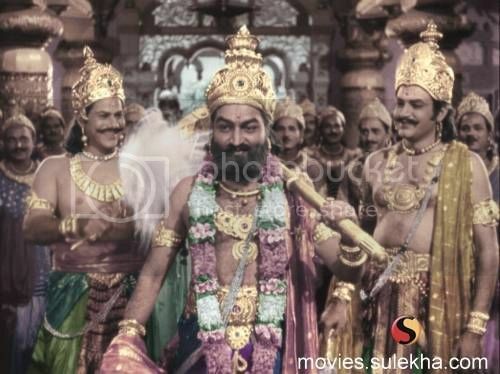 I especially loved Savitri(the female lead) and Ranga Rao(who plays the Rakshasa Ghatotkacha), and I felt these actors had had a lot of fun doing their roles. I'd recommend Rajaji's Mahabharata to start with and then look at various interpretations and retellings if you're further interested. It's a bit basic, but it's kinda the version most people take as 'standard', though of course, with a book like the MB, there is scope for any number of perspectives and interpretations. Anyways, I think I've gone on too long. Maya Bazar does that to me. Maya Bazaar is a classic. The most famous song from this movie is Vivaha Bhojanambu--the wedding feast. I saw Maya Bazaar as a play recently and this song in particular was recreated with great special effects. The actress was Savithri - alongwith NTR and SV Ranga Rao (actor who played Ghatotkacha) was the most talented Telugu actress/star/performer of her time. The most interesting thing @ Maya Bazar is that it's (also true of a lot of other Telugu mythologicals) fiction woven around Mahabharata - the story doesnt feature in any of the texts. But the story is woven in an entertaining yet respectful way so it's not a big issue. If you're looking for more of these classics, I'd recommend Missamma and Gundamma Katha. "Krishna Gaaruddhi" is another film of the same type, almost as funny as Maya Bazaar. Krishna decides to teach Arjuna and Bheema (the third and second of the Pandavas) a lesson since they are becoming very arrogant and consider themselves invincible. But do read up a little bit of the Mahabharata (even the Amar Chitra Katha comic version will do) so that you get of the background story.